I was on the section of Seventh Avenue paralleling the Union Pacific’s mainline. And I nearly jumped over the handlebars when a UP freight, pounding up the tracks behind me, let loose with its horn, twice. Then I stopped and watched a long line of war-fighting equipment being hauled north. This is not an everyday sight, as far as I know. Although, just a few weeks ago, on another ride, I saw a train carrying what looked like the same kind of equipment barreling south. 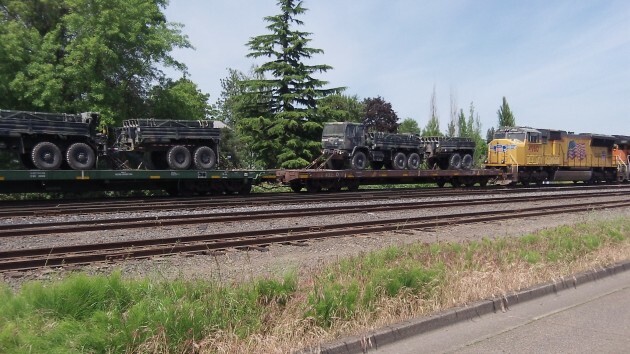 So maybe, maneuvers completed at Twentynine Palms or some other part of California, the gear was returning to its home base in Washington state. It struck me that in parts of the world — North Korea comes to mind — stopping to photograph a military transport might be a punishable offense. Good thing we’re not there. The engines were past me by the time I freed my camera for a still. Best, as you say, the “war fighting” gear return to a military base rather than being offloaded for pennies on the dollar to the local “militarized” PD. Love the video and great timing on your part. Keep up the posts!! Funny coincidence: About 2 weeks ago driving in Spain we were passed by a long convoy of tanks and armored personnel carriers, and a bunch of items covered up. I guess it’s the time of year. Our grandson has been on maneuvers in Twentynine Palms since late April. He lives in NC. His 6 weeks or so is just about done so your guess is probably pretty accurate! On this Memorial Day, I am very proud of our 12+ years Marine and all the others selflessly and faithfully serving America!